This is an opinion piece, so nothing in it is official, confirmed or in any design documents – it’s just a culmination of ideas. Currently if you want to be bad in Elite: Dangerous, you kill people. Players or NPCs. Currently there is no recognition for being good at it, or consequences for being too bad. Piracy and/or smuggling is supposed to be a career path in Elite, so I would like to see some changes on how this path is presented in the game. Firstly, successful criminal behaviour should gain status. If we can have a rank for CQC then we sure as heck can have a “Criminal Rank”. Okay, that sounds cool, but how would it work? Other career paths grade you on how much you trade, or how much exploration data you collect, or how much kill-bounty you amass. The criminal career path would take into account the quantity of smuggled, stolen and black market goods, weighted by the security of the system they are sold at (high security systems score more than low security systems). This would be augmented by the bounty on your head, which adds to the total, however if you are killed this goes down, so you could lose criminal rank. Only the most hardened and dangerous pirates and killers would make Elite. That’s where consequences come into play. A cargo scanner should add a “demand cargo” function to the communications panel, so pirates can easily send a message to prospective marks. This is something that should be key-bound. That way getting this message the victims know how to respond. If you kill someone currently, you get a 6,000CR fine and wanted status in just the local system for a period of six days, after which you can pay it off. You can kill ships (human or NPC) then avoid the “scene of the crime” and unless you get scanned with a Kill Warrant Scanner, you’re home free. To change this, I would propose that if you kill someone the first time, the same mechanic is employed, but if you kill a second person while you have an outstanding warrant, then the outstanding fine becomes a permanent bounty and cannot be paid off. This would be repeated for each subsequent kill. Any permanent bounty is attached to your rebuy, so if your ship is destroyed you have to pay your own bounty plus the normal rebuy to get the ship back. This means being killed as a bad guy carries a lot more risk, but it doesn’t mean you can’t still be a bad guy. Once the local plus permanent bounty reaches a threshold value (1M CR), if you are in a Federation or Empire system the warrant would then go Federation or Empire wide. High security systems should become just that. Any interdictions or attacks should attract an immediate and robust security response in seconds. This will push piracy into low security systems where the response is minutes, and killers into anarchy systems where they can kill pilots without any bounty on their head. Making anarchy systems dangerous and shady places. I would at the same time, raise the value of legitimate goods (by 10% and 20%) in those systems. Best commodities markets are also in the most dangerous systems. Don’t want danger? Stay away. Rather than a list of bad guys in stations that tells you nothing, bounty hunters should get a live feed in GalNet of the top five criminals in the area online in the same game mode - including NPC bad guys where no humans are around. The game should generate a few persistent NPC pirates and griefers that are each local to a handful of systems. So you know if you visit the Leesti area you may well run into the mad-dog killer “Captain Ed Lewis” who’ll blow you away for kicks. Or the dread pirate “Don Antonaci” who’ll take 20T of whatever you’re carrying or else! Finally the game needs NPC Wing Men and a method of hiring wingmen (human or NPC) at stations for a fixed fee (hourly rate) with human CMDRs getting their rebuy discounted by 25% if they die during a contract. NPC Wingmen cannot differ greatly from whatever AI is being written for ship launched fighters, so I see no insurmountable obstacles to getting this added. Following the release of 1.5, I have been beavering away at getting my Imperial rank to that of Duke, so I can buy an Imperial Cutter as a trade ship. Gaining rank was easier in 1.4, but with the revised mission structure post 1.5, many of the previous “hot” locations are now no good for ranking up. I had, in 1.4, been carrying out long-range trade missions from Fehu – these paid really well and gained me rank in the process. I had elevated myself from Viscount, to Count (the fangs chafed) and then Earl, then 1.5 was released and I stalled. The game now policed missions more carefully, which meant mission stacking was far less likely – no more two-of-the-same missions. The progress bar now spelled out how far I had progressed, but as they say “the watched pot never boils”. So I relocated to another system I had visited by chance, CD-41 359. There is only an outpost there, but the Bulletin Board had a rich mix of short-distance courier missions and more critically, high reputation donation opportunities. So loading up my Asp “The Cousteau” with missions I set off and got delivering. This meant in the hour or two I had each evening, I could push my rank up another 1 or 2 percent. Two medium reputation missions seem to give around 1.5% (estimated) so any high reputation smuggling (don't get scanned) missions were a bonus. It took several weeks to make the next rank, Marquis – although I had other problems which impacted my time. This contrasted sharply with my efforts to make Baron early last year, when I loaded up my Cobra, flew down to Iota Hydri and made that rank in two days! During the period November to January, I had a faulty power supply on my PC which caused a shutdown under load, so I replaced that in early December and I also had been experiencing communication errors with Elite servers, which meant I never got more than a couple of hours play before being thrown out of the game. These have been resolved just this week, by changing the MTU setting of my network card to prevent the game straining my BT Home Hub beyond its capabilities. 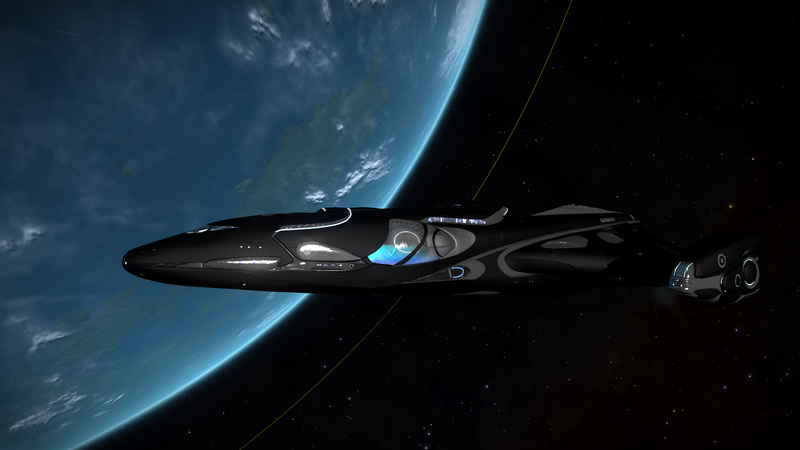 So I finally got the oh-so-precious "Naval Ascension Opportunity" and made the rank of Duke on Sunday and as I returned to my current home base at Shinrarta Dezhra, it felt like I had run the proverbial marathon. But it was worth it.